Many clubs are using new formats to engage with women and girls, offering both traditional formats and more social formats like CricHIIT, Women’s Soft Ball Cricket and The Wee Bash. CricHIIT is a fitness programme combining High Intensity Interval Training (HIIT) and basic cricket skills. Sessions last just 45 – 60 minutes and can be delivered at three skill/fitness levels. CricHIIT is suitable for secondary school pupils, students, adults – just anyone who enjoys getting fit and learning a few new skills along the way, with some tunes in the background in a relaxed environment. Women’s Soft Ball Cricket is a great way for women and young women (secondary school) to learn or just enjoy the game of cricket without all the hassle of a proper pitch, all the protective equipment and complicated rules. This game can be played indoors or outdoors on any surface, an astro turf hockey or football pitch is perfect, or just on the outfield at your local cricket club. Teams are made up of 6 to 8 people and each game takes no more than an hour. All equipment is provided. The Wee Bash, Scotland’s very own version of Australia’s “Big Bash League” are monthly, 6-a-side indoor soft ball tournaments played Oct-April. Teams represent clubs, secondary schools, universities and combined clubs. It’s a great way to keep in touch with cricket friends over the winter, enjoy the game and work on skills. The East Regional Women’s team are called the Eagles, who play in the Cricket Scotland Regional Women’s series of 50 over and T20 matches against the other Women’s Regional team: the Stormers. 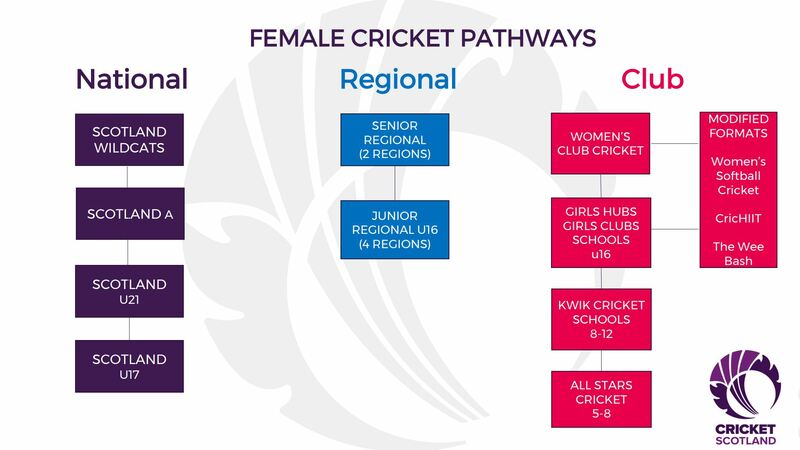 Cricket Scotland’s u16 Girls Regional Series sees the three regions: Eastern Knights, Caledonia Highlanders and Western Warriors playing in a series of 40 over and T20 matches. The Eastern Knights u16 Girls Development Squad brings together girls in the East Region that are keen to develop their skills in order to progress to the Eastern Knight u16 Girls Squad and beyond. Madison Garland is the development officer for female cricket in the East. Madison helps clubs link to schools and offers support in setting up programmes and events to engage more women and girls. James Carr is the City of Edinburgh Cricket Development Officer and can also assist with anything related to women and girls’ cricket.